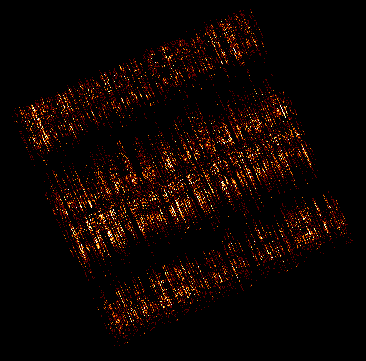 There is a feature in the serial readout of the ACIS-S4 CCD (CCD_ID=8) such that for a particular frame of data, spurious events (with moderate to small pulse heights) are occasionally reported along a single row of a node. The rows and nodes affected by the problem vary from frame to frame. The streak events are almost uniformly distributed across the rows (i.e. in the CHIPY direction; Figure 2). From column to column (i.e. 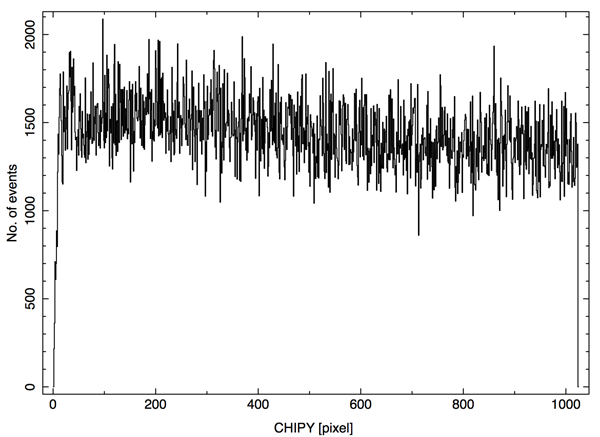 in the CHIPX direction), the distribution of streak events is peaked in the columns closest to the read outs (i.e. 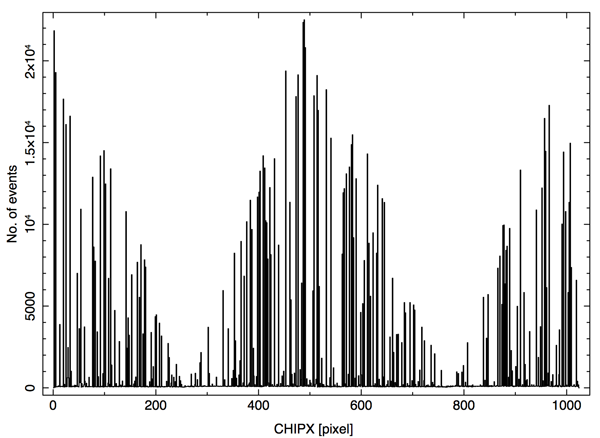 at CHIPX values near 2, 512, 513, and 1023; Figure 1). Typically, the fraction of the frames that are affected for a particular row of a node is quite small (< 0.01%). The streak event rate seems to be correlated with the flux of charged particles. For more information, refer to the destreak memo. Horizontal streak events on ACIS-S4 should not be confused with the "out-of-time" events described in the Remove the ACIS Readout Streak thread. The destreak tool is designed to identify events associated with the ACIS-S4 streaks. It was incorporated into the standard data processing (SDP) with software version DS 7.3.0. By default, it is used for all timed exposure and continuous-clocking mode ACIS observations that include the S4 CCD. Events identified as being part of a streak have STATUS bit 15 set in the Level 1 event data file and are excluded from Level 2 event data files. In this case, all events are included in the search for streaks. These changes were implemented because, in general, they improve the streak identification efficiency and prevent pixels with several streak events from being misidentified as hot pixels. The chandra_repro script or the Reprocessing Data to Create a New Level=2 Event File thread can be used to reprocess data using the new technique. For bright, continuum-dominated sources observed with the gratings, it is possible for destreak to misidentify a significant fraction of the source events as streak events. To determine if this problem adversely affects your data, execute destreak as follows. Figure 3. A typical distribution of streak events. No sources are apparent. For the case illustrated in Figure 3, it is safe to discard the streak events. If the image had shown that some source events were being misidentified as streak events, then the data can be reprocessed as described in the Reprocessing Data to Create a New Level=2 Event File thread, except that the destreak max parameter should be increased. Alternatively, the data could be reprocessed without using destreak by executing the chandra_repro script with destreak=no. Since order sorting greatly reduces the amount of streak data present in a grating spectrum, it may not be necessary to use destreak for analyses of grating data. If your data were obtained using the VFAINT mode and you want to use the VFAINT mode background reduction algorithm in acis_process_events (i.e. want to execute acis_process_events with check_vf_pha=yes), then destreak should be executed before acis_process_events. Otherwise, the streak identification efficiency may be reduced. To ensure that these two steps are performed in the proper order, reprocess your data with the chandra_repro script or follow the Reprocessing Data to Create a New Level=2 Event File thread. Refer to the ACIS VFAINT Background Cleaning why topic for more information and some caveats. Since the background for grating spectra is much larger for continuous-clocking mode observations, we recommend using destreak on all continuous-clocking mode observations that include ACIS-S4, even observations of bright, continuum-dominated sources. Otherwise, the spectral data on ACIS-S4 could be significantly contaminated by streak events.